Behind every successful woman is a supportive man. There are several men who support my running but my biggest cheerleader is my husband, Dave. He didn’t laugh at me (which I fully expected) when I told him that I wanted to try running with the Toronto Olympic Club; he silently encouraged it by taking over the parenting duties on Monday and Wednesday nights, which initially meant struggling to cook Kraft Dinner in hope that the boys would actually eat it (and that worked until they started to hide the KD boxes on him and beg for something different). Dave has driven me to umpteen races and cheered me in proudly and, most importantly, he has never complained when I need to buy new running shoes. 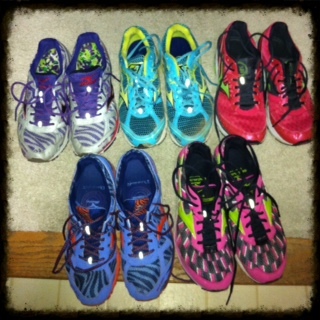 I love my Mizunos: the Elixir, Ronin, Wave Rider, and Precision. While I may try other brands, I always end up going back to Mizuno. But while I love the brand, I wish that I could get more than 400 miles out of a pair, depending on the shoe. I’ve been told that speed workouts will break down a shoe faster than easy running as you are landing with more force each time. Looking back in my running history, I probably was getting the same mileage out of other shoes, but that was before my days of intervals and tempos, and it took about 6 months to run 400 miles. Now that I’m averaging 40 miles a week, I’m lucky if I can run through a pair of shoes in 3 or 4 months. So, I have to try to find ways to extend the lives of my Mizunos? First, I rotate shoes. Even though I might notice the support in a pair is breaking down, I’ll still wear them – but on trails or softer surfaces so that my feet don’t complain too much. I keep my freshest pair for the tough stuff – Monday’s intervals, Wednesday’s tempo or the weekend’s long run. If, however, roads are messy from snow, slush or rain, I’ll pull out an older pair and beat up those shoes instead. Once my shoes truly have no more running life in them, they become my day to day shoes and I wear them to school with my jeans. With such bold colours and funky styles, they always go well with jeans – and the kids at school love it when I come to school in a “new” pair of shoes. This week, I’m ready to start breaking in a new pair of Mizunos. Since running the Buffalo Marathon, I’ve been rotating between Wave Riders and Elixirs; the Wave Riders (top right, pink) that I marathon trained in are about to be retired to the trails and the Elixirs (bottom right, black and pink) are almost ready to go to school in September. I’ll probably pick up another pair of lightweight Elixirs but the new Sayonara, which is replacing the Precision, has my interest. I’m always envious of friends who are able to get 800 miles out of a pair of shoes. When all is said and done, how many miles do you get out of yours? What do you do when you can’t run in them anymore? Finally, in case you were wondering, Dave rarely buys me flowers. He’d rather invest in something that will really make me smile: my Mizunos. I was just counting up my shoes last night and realized I have 5 pairs that I can run in right now (some older, good only for short runs on easy surfaces). This feels a tad excessive to me, lol. Glad i'm not the only with a huge collection of shoes!